This book originated from a course of lectures given at Yale University during 1968-69 and a more elaborate one, the next year, at the Tata Institute of Fundamental Research. Its aim is to present a detailed ac- count of some of the recent work on the geometric aspects of the theory of discrete subgroups of Lie groups. Our interest, by and large, is in a special class of discrete subgroups of Lie groups, viz., lattices (by a lattice in a locally compact group G, we mean a discrete subgroup H such that the homogeneous space GJ H carries a finite G-invariant measure). It is assumed that the reader has considerable familiarity with Lie groups and algebraic groups. However most of the results used frequently in the book are summarised in "Preliminaries"; this chapter, it is hoped, will be useful as a reference. We now briefly outline the contents of the book. Chapter I deals with results of a general nature on lattices in locally compact groups. 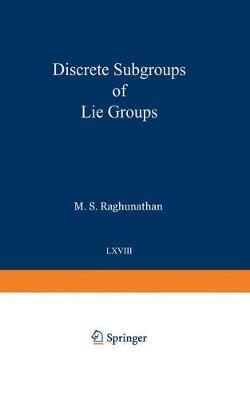 The second chapter is an account of the fairly complete study of lattices in nilpotent Lie groups carried out by Ma1cev. Chapters III and IV are devoted to lattices in solvable Lie groups; most of the theorems here are due to Mostow. In Chapter V we prove a density theorem due to Borel: this is the first important result on lattices in semisimple Lie groups.